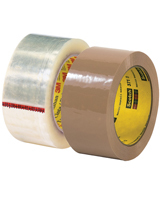 3M 371 Green 48 mm x 100 M is a pressure-sensitive rubber resin adhesive that instantly seals cartons. 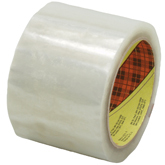 Biaxially oriented polypropylene backing is easy to handle and dispense. Resists abrasion, moisture, chemicals, and scuffing. 1.9 mil 3M 371 Green 48 mm x 100 M 3M ID 70006107364 conforms around edges and over rough surfaces for a tight seal. Good edge tear and split resistance.